Add new document On the Edit tab, in the Edit group click New. Remove a document On the Edit tab in the Edit group click Delete to remove the selected document from the document list on the right side. Copy and paste Create quickly documents with the help of Copy and Paste feature on the Edit tab in the Edit group. Open a document Choose one document from the document list on the right side. On the Edit tab in the Edit group click Open. View file properties On the Edit tab, in the Documents group click File Properties to open them. On the File Properties dialog box list the tabs to view and change the properties. Send a document via email On the Edit tab, in the Documents group click Send As Mail. In the drop-down list select Send Link(s), if you want to send only document path, or Send Document(s) to send the document as an attachment. Create a new subfolder Choose a folder from the document folder tree view on the left side. On the Edit tab, in the Documents group cllick New Folder. In the Create New Folder dialog box type a new name and click OK.
For more options on how to create a new subfolder, see Create a new subfolder. 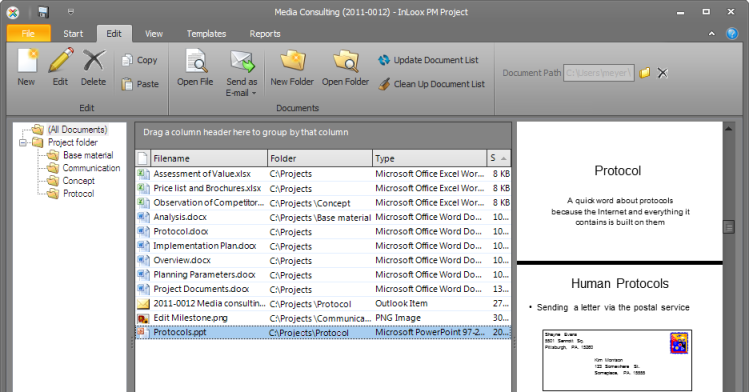 InLoox PM creates automatically a new subfolder in the document folder view. Open a document folder On the Edit tab, in the Documents group click Open Folder to open the document folder in Windows Explorer or the web browser (in the case of a SharePoint document library). Update Document List Refreshes the document folder view and the document list by reading all entries of the file store or SharePoint system. This feature is available on the Edit tab, in the Documents group. For more information see Create and change the document folder path, in the Create the Document folder path. Clean Document Folder Removes all orphaned entries of the document list. This feature is available on the Edit tab, in the Documents group. For more information see Cleaning the document list. Choose the document folder path On the Edit tab, in the Documents group click Folder . For more information see Create and change the document folder path. Delete the document folder path On the Edit tab, in the Documents group click . InLoox PM selects the document folder anew according to the document folder rule as soon as a new document is added to the project. Print a document list On the View tab, in the Common group click Print to start the quick print feature of the document list on the right side. For more information about printing, see Generale features and print of the project list, in the Print in the project list. Change the preview area InLoox PM provides you with the preview area to view important infomation of each document without openning it. On the View tab, in the Common group click Preview Area. In the drop-down list click Right or Bottom to set the preview area where you want. Click Off to deactivate it. If the element was added to the project using the button Add to Project the following is also included: Outlook sender, Outlook topic, Outlook received on. For more information see Add Outlook elements to InLoox PM. Use Copy and Paste features in the document, on the preview area. 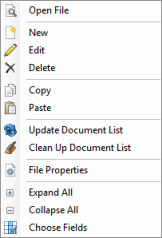 The context menu of the document list provides you with almost all basic features that are also available on the Documents page, on the Ribbon, such as Open File, New, Edit, Delete, Update Document List, Clean Up Document List, File Properties, Copy and Paste. It has also such features as Expand and Collapse All Groups, Choose Fields. Right-click in the document list to open the context menu. CTRG+C Copy a document into the clipboard. CTRG+V Paste a document from the clipboard to the document list. How to add project documents in InLoox PM 7 • Copyright 1999-2019 © InLoox, Inc. All rights reserved.